PlateRite Ultima 48000 | SCREEN Graphic Solutions Co., Ltd. In recent years, the publishing and printing industries have been striving to achieve efficient production of variable products with faster turnarounds. The ability of creating a plate with multiple jobs to print at once has increased interest in the use of super-large-format web offset printing presses. 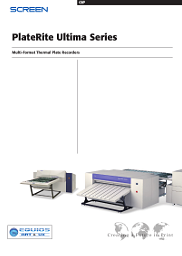 The PlateRite Ultima 48000 thermal plate recorder has been launched to meet the needs of users who wish to take full advantage of the super-large format printings. Advanced 1,024-channel imaging headGLV™ (Grating Light Valve™) technology employs production techniques used in semiconductor manufacturing. A GLV™ array consists of thousands of microscopic reflective ribbons placed over a silicon chip. These ribbons can be moved up and down to reflect or diffract an imaging laser targeted at the array, simultaneously turning on and off a high number of optical channels. SCREEN uses its tried-and-true laser control technology to precisely target a high-power laser at the GLV™ array, which makes it possible for the flagship SX models to simultaneously control 1,024 channels of light. This dramatically increases the width of the area that can be imaged with each rotation of the drum and contributes to much higher productivity. Higher productivity with dual plate loadingThe advanced PlateRite Ultima 48000 can image two plates together on the drum. In other words, these models are perfect for imaging not only large-format plates but also pairs of smaller plates together. Imaging pairs of plates increases productivity since the number of loading and unloading plates can be reduced. 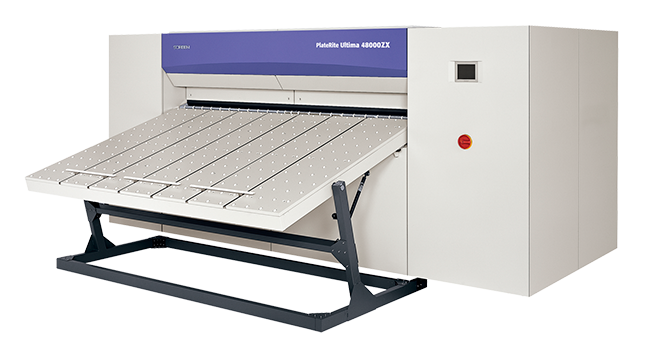 Automatic inline plate punching for extremely high registration accuracyThe PlateRite Ultima series features an automatic inline punching system that helps eliminate misalignmenti caused by improper plate positioning, and results in superior registration accuracy. When optional press punch blocks are used (up to 10 punch blocks can be mounted and selected according to the plate size and press type), the imaged plates can be loaded directly onto the press after output. The use of press punch blocks during plate output eliminates the need of manual punching afterwards, ensures excellent registration accuracy, and creates the foundation of the perfect results on press. It also dramatically shortens press make-ready time and improves press operating ratios, for even better overall productivity. Automated plate loadingMounting larger and heavier plates not only becomes the burden on the operator but also reduces the efficiency of the CtP production line, since the use of larger plates increases the risk of damaging plates when handling and much time is required for loading operations. Automatic plate loading is critical to ensure the stability of the CtP operations when using large-sized plates. The PlateRite Ultima 48000 can be fitted with the optional MA-L40000 and/or SA-L48000 Skid automatic plate loaders, both featuring the PlateRite series’ renowned plate transporting technology. These automatic plate loaders make it possible to create a fully automated production line. *1 A minimum size of 650 x 550 mm is offered as a factory option. *2 When the punchless plate handling option is used, the leading edge gripper margin is 5 mm and the trailing edge gripper margin is 7 mm. *3 When the factory option for support of 0.5 mm thick plates is selected, the supported plate thickness is 0.3 to 0.5 mm. *4 1,200 dpi uses doubled 2,400 dpi dots. *5 For information on system dimensions, please consult your Screen representative. *6 There are limits to the sizes of plate this unit can handle.